I know, I know…it’s a “religion of peace”. It’s also not biblical Christianity, which pretty much instantly qualifies it as some kind of a good thing these days. And yes, I know that Islam and its many defenders, both Muslim and non, frequently pitch Islam as a great force for peace, love, and progress in civilization. We are told again and again and again that Islam is a “religion of peace” filled with loving people who have a long, rich tradition of improving the cultures and civilizations in which they live. I’ve heard it a million times. And so have you. So what’s up with the whole mass decapitation and bloody rampage thing? Is it just me, or is “religion of peace” incompatible with “mass decapitation of innocents”? I mean, forgive me for perhaps coming across as too simple on this, but it sure does seem as though the proliferation of both spontaneous and systematic decapitation as a hallmark of this religion in action is…well…much more indicative of pure evil than anything I’d consider to be even remotely related to “peace”. You see this too, right? Surely all of us who are not on staff at the White House or at MSNBC must have noticed this by now. We’ve got al-Qaeda/ISIS/ISIL/Islamic State systematically massacring innocents by the (Titanic sized) boatloads, leaving a bloody swath of decapitated, mutilated, and crucified men, women, and children in their path, and we have Muslim Alton Nolen decapitating a woman (en route to trying to kill another) this week in… Moore, Oklahoma. So, from the Middle East to Middle America, we have the same basic idea on display: Kill the infidels. More specifically, cut their heads off by putting a knife to their throat and using it…just as the god of Islam commands. From the Middle East to Middle America, we have the same basic Islamic idea on display: Kill the infidels. So, if the twelve-steppers are right and the first step to solving a problem is admitting that you have one, isn’t it maybe well past time that we admitted that we have a problem? Just to be clear on this point, I’m not talking about the evil of Islam. Not yet anyway. I’m talking about the real problem that has led us to this place where we can’t even call an obvious evil “evil”. I’m talking about our fundamental rejection and disconnect from objective truth….that truth being found in an actual Person. We’ve blissfully allowed ourselves to be led to this place for many generations now, and the fruits of our faithlessness are now coming into full, foul bloom. 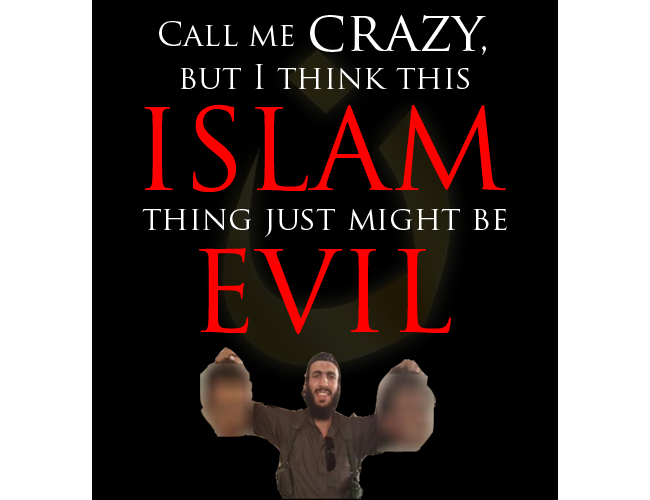 We can’t call Islam evil and we can’t even acknowledge that the Islamic State is Islamic for the same basic reason that we can’t acknowledge the open (but never admitted out loud!) lies and ridiculous fictions that now thoroughly define our approaches to everything from economics and politics to work and children’s education. Our economy is built upon Monopoly money-style fiat currency purposefully crafted by an elite few in order to own everything and everyone beneath them – yet we dare not contemplate, much less even begin to effectively address, this most intimidating, Matrix-esque problem. We just keep our nose to the grindstone, serving those who type the “money” we slave for into existence out of thin air. We try our best just to not think about it and enjoy our EBT bread and NFL circuses as Rome burns around us while the (Islamic?) barbarians beat down her gates. Our government has for decades now routinely employed and encouraged Orwellian double-speak and double-think at every turn to advance the growth of the State and the surrender of individual liberty for American citizens. Consequently, we presently have in “the land of the free” a “Patriot Act”, NSA-fueled spy state nightmare that would make the KGB, Stasi, and Gestapo green with envy. We routinely (and quite happily) feed our children to this State for an “education” that purposefully stands in direct violation of the loving commands of God clearly recorded in His Word on the subject of children’s education. And we dare to wonder how we got to where we are now as a culture; how it “came to this” in America. We are where we are because of our prideful, persistent, systematic rebellion against God – the very God so many of us claim with our lips and whose name we blasphemously attach to the phony “money” He calls “an abomination” (see: proverbs 11:1). We test Scripture in light of America rather than America in light of Scripture. In this, we have embraced a thoroughly satanic approach to pretty much everything. If that sounds harsh, ask yourself why? What is a “satanic approach”? For the answer, just check out Genesis 3, where “all the serpent does” is convince man that he can measure and pursue knowledge apart from God’s clear commands. That is satanism..and that is what we do – proudly – in every realm of American culture. Do I hate what Islam stands for? Do I hate what I see it doing to the people and cultures with which it comes into unrestrained contact? Do I personally resolve to do whatever I am able to do in opposition to this explicitly evil force and nightmarishly destructive worldview? But before I can effectively do that good and noble thing, I must first seek the Lord. I must submit to Him. We must seek and submit to His nature as revealed in His Word as the source of truth and life in every aspect and realm of His creation. The Christ-centered, Gospel-fueled Great Commission is our only hope. No matter what Fox News tells you. No matter what the Republican Party tells you. No matter what Rush Limbaugh, Mark Levin, Sean Hannity, or anyone else tells you. The time for man-made, man-centered “solutions” is over. We have had more than enough time and more than enough attempts at those things to see that they are only capable of leading us deeper down the rat hole. The Word of God openly sought and applied to every realm of His creation right here and right now is the only hope that we have…and the only hope that we need. Lord willing, America’s rebellion will not end by way of the sword of an enemy raised up in righteous judgment against a proud and unrepentant people, but will instead come through Great Commission-driven conviction, repentance, and restoration, all led by His people by His grace and for His glory.